As I am writing this, the current temperature here in Minnesota is -11 F (-23C). This isn’t your average cold. It’s the kind of cold that makes your nose hairs freeze when you inhale. It’s the kind of cold that makes your skinny rings fit on your fatter fingers. It’s the kind of cold that makes you want to bake something just so you can turn your oven on. Don’t let the name of this recipe deceive you. These aren’t your typical cookies. They’re savory cookies, not sweet. They’re kind of a cross between a cheese biscuit and cheese crackers. But the texture is like a buttery cookie. They are absolutely delicious and addicting. They go great with soup, but can be eaten on their own as a snack. 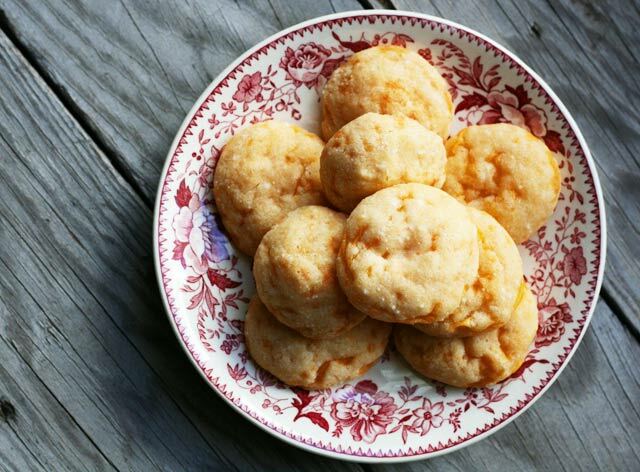 These cookies are best made with sharp cheddar cheese. Extra sharp if you can find it. I like a bit of bite to my cookie. If you’re more fond of pepper jack cheese, try these savory pepper jack cookies. Make a batch of these cookies and include them on a party appetizer board. It’s looking like it’s going to be a long winter here in Minnesota. My favorite coping mechanism is to turn on the oven and bake something. What do you do to stay warm on the coldest days of winter? These cookies are best eaten warm. Any leftovers can be stored in the fridge for a week or more. To reheat, warm in the microwave for 10 to 15 seconds. Mix all ingredients together in a large mixing bowl. Take a heaping teaspoon of dough and roll into a ball. Place dough balls on a cookie sheet and refrigerate for one hour. Preheat oven to 375F. Bake cookies for 8 to 9 minutes, or until lightly golden brown. Remove cookies from oven and place on a cooling rack. Made these and had them with cream soup tonight. YUM YUM!! Just getting through posts in my reader that I saved to come back to… and so glad I did with these. They look outstanding, and like a great snack or appetizer. How do you think these would be without the hot sauce? 😉 How spicy hot do they get? Oh yes, you can definitely leave out the hot sauce. However, they don’t get very spicy at all. Maybe try just a couple of drops? These look wonderful. If I was looking to use almond or coconut flour could I substitute and what kind of adjustment to quantity would I need to make? Also, do you think adding a few drops of liquid smoke instead of hot sauce would make a good cookie? Thank you! Hi Judy – Great question about the almond or coconut flour. I haven’t tried either. Let me know if you try them! Also, I think liquid smoke would work well, but I would start out with just a couple of drops and go from there. Question – can this dough be used with a cookie cutter? I’ve never tried it but I don’t see any reason why it wouldn’t work… let me know if you try! I love these Cheese Cookies. Thank you for sharing this recipe because I can’t find my copy. I use to roll my dough in parchment paper. Make a log out of the dough and refrigerate for about an hour. Unroll from parchment and slice dough. These are wonderful, especially with a cold beer or red wine. I put a pecan half on top, or a piece of bacon or sprinkle with raw sugar. But my husband’s favorite is when i add a touch of maple syrup to the batter. I use a 1/2 T cookie scoop to portion tbe dough. I’m totally going to add a pecan on top next time I make these. Thanks for the suggestions! I wanted to thank the Author.. I am the executive chef of a fine dining restaurant, and wanted to make a cheddar cookie to go with my cauliflower soup. I wanted to make Biscotti to sit on the bowl- so I doubled the recipe, and added 3 eggs as well as 2 tsp baking powder. I formed the dough into a Biscotti “loaf”, baked for 35 minutes, and then froze the par baked loaf. I then cut thin Biscotti slices and baked them on a baking sheet (325) for 15 minutes, and then flipped and turned them, and baked for another 15 minutes. I wish I could post a picture- they are beautiful, crispy, and rippled with cheddar goodness! Thank you for the basic recipe/ratios! I love this idea, Chef Aaron! I might have to try that myself. Thanks for your comment!